A West Mercia police officer who sent sexual text messages to female victims of crime has been jailed for 15 months. PC Jordan Powell, 31, who admitted misconduct in public office, also illicitly met a victim of domestic abuse while he was on duty. Gloucester Crown Court heard how he was caught when an undercover female officer posed as a victim of crime. 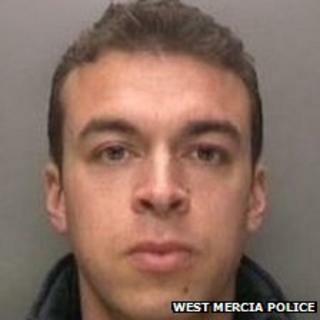 West Mercia Police said Powell, who joined the force in 2004, would face a misconduct hearing in the near future. Sentencing, Judge Jamie Tabor said that Powell's behaviour "undermined public confidence". Speaking on behalf of West Mercia Police, Assistant Chief Constable Gareth Morgan apologised to the women affected by Powell's actions. "This officer acted in an unforgivable way and abused his role and the position of trust that he had been given," he said after the sentencing. "He has exploited his role and targeted vulnerable women for his own personal gratification."